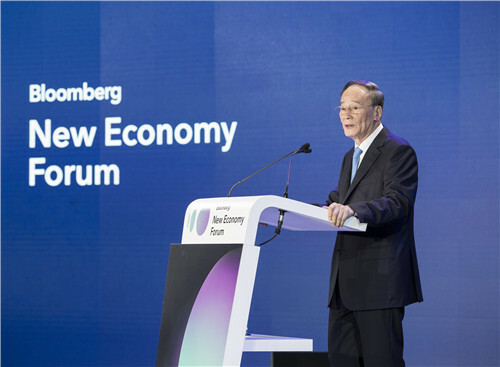 On November 6, 2018, Vice President Wang Qishan attended at invitation the opening ceremony of the 2018 New Economy Forum held in Singapore, and delivered a speech themed Conform to the Trend, Innovate and Develop Together. Wang Qishan expressed that the current global politics and economy are undergoing the most profound changes after the Cold War, and facing such challenges as maintaining stable development of the world economy, demographic changes, climate change, governance capability lagging behind of the development of science and technology, widened development imbalance, backwardness in global governance mechanisms, and resurging of populism and unilateralism. However, challenges breed opportunities. Human beings are constantly expanding their cognition of themselves and the world, and we have more powerful capabilities than our predecessors and can lead a better life through peaceful development, reform and innovation. Through historical, cultural and philosophical thinking, we should inherit the wisdom of our predecessors, use modern thinking, and well grasp the dynamic balance on our way forward. Wang Qishan pointed out that the key to coping with the challenges should be following the trend, grasping the general direction, and maintaining concentration. We should persist in advancing human peace and development, respecting the development paths that were chosen by the people of all countries based on their independent choices, and resolving various differences through consultation. Starting from ourselves, we should let development outcomes truly benefit the people through reform and opening up, deepening innovation and transforming development modes. Wang Qishan pointed out that socialism with Chinese characteristics has entered a new era. History, reality and the future are closely linked. Only by understanding China’s history and culture, can we understand the path, theory, system and cultural support of China’s choice. The great achievements of China’s reform and opening up in the past 40 year can not be separated from the arduous struggle of nearly 70 years since the founding of the People’s Republic of China. To understand the history of nearly 70 years of the People’s Republic of China, it must be traced back to 1840. From the moment of being defeated by the powers, the unyielding Chinese people have been trying hard to find a way to stand up again, to be rich and to be strong. After suffering and brilliance, China has forged more than 5,000 years of continuous Chinese civilization. The unique history and culture determine that China can only take its own path with its own characteristics. The revival of human history is for a glorious history. Wang Qishan emphasized that China is still a large developing country and the principal contradiction facing Chinese society is the contradiction between unbalanced and inadequate development and the people’s ever-growing needs for a better life. China will persist in focusing on well managing its own affairs, carrying out the coordinated advancement of the Five-Sphere Integrated Plan, and putting into practice the new development philosophy. The internal affairs determine diplomacy. President Xi Jinping delivered an important speech titled “Work Together for an Open Global Economy That is Innovative and Inclusive” at the opening ceremony of the first China International Import Expo. China will continue to adhere to the fundamental national policy of opening up, promote the construction of the Belt and Road Initiative through the concept of extensive consultation, joint contribution and shared benefits, firmly support the multilateral trading system, and oppose unilateralism and trade protectionism. China is willing to work with all countries in the world to jointly promote economic globalization to develop toward a more open, inclusive, universally beneficial, balanced, and win-win direction, and jointly build a community with a shared future for mankind. Wang Qishan expressed that cooperation between China and the United States (US) leads to win-win results while conflict ends up with a loss for both sides, and it will directly affect world development and stability. Economic and trade cooperation is still a ballast stone and propeller for the sound and stable China-US relations, the essence of which is mutual benefit and win-win results. The Chinese side is willing to hold consultations with the US side on issues of common concern, and promote bilateral economic and trade issues to reach a mutually acceptable solution. On the sidelines of the Forum, Wang Qishan also met with the Founder of the Forum Michael Bloomberg, Honorary Chair of the Forum’s Advisory Board Henry Kissinger, Chair of the Forum’s Advisory Board Hank Paulson and other guests present. The first New Economy Forum was held in Singapore from November 6 to 7, 2018, with the aim of assisting all countries in exploring feasible solutions to globally important issues and complex challenges.